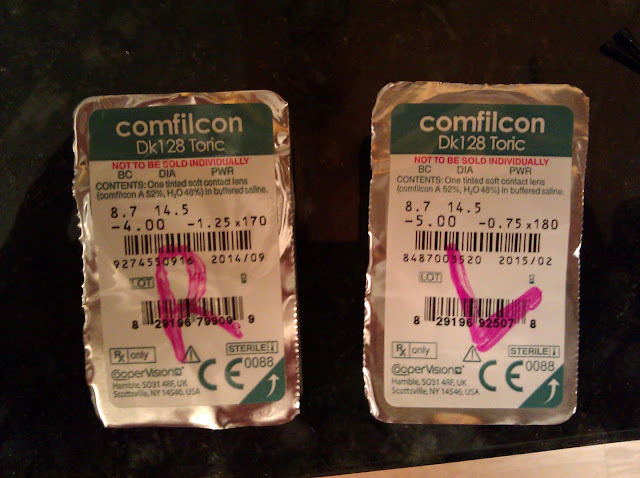 I've worn Bausch & Lomb Toric SofLens (alphafilcon A) lenses since forever. The lenses are meant to be worn for 2 weeks, but I usually stretch them out to 4 weeks. I find my eyes very dry after just a few hours of wearing even new lenses. I know newer types of lenses have been released, but not until today did I do research on them. My wife has worn CooperVision Biofinity (comfilcon a) lenses for some time. The lenses are meant to be worn for a month. They use "hydrogel" technology. I read this interesting article: Looking at Silicone Hydrogels Across Generations. Who knew the world of contact lenses was so complicated? No wonder optometrists never go over them; it's difficult to explain and the choices probably confuse people more than aid. I asked my optometrist if I could try the CooperVision Bionfinity lenses. Today is my first day wearing them. I hope these trial contacts suit me well. I have just got the exact same lenses. The same numbers are yours. 8.7 and 14.5 but mine are different numbers underneath. I am really trying to find somewhere that I can just buy them from and get delivered as the place where I buy them from doesn't deliver and I have to take time out of work to go and get them. Do you know what the numbers underneath me.